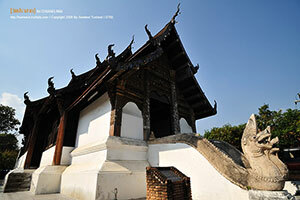 Wat Prasat, located on Inthawarorot Road near Wat Phra Sing. The temple houses traditional Lanna architecture chapel, the chapel roof is decorated in colourful glasses and wooden craved lions. Wat Prasat houses one of the rare Lanna arts’ Buddha image.